One hundred years ago, on May 18th, 1917 piano manufacturers, suppliers, salesmen, dealers, in fact everyone involved in the piano trade descended on Chicago, Illinois for the annual Music Trades Convention. All of pianodom visit this annual event which comprised a series of conventions and exhibitions lasting over a week. 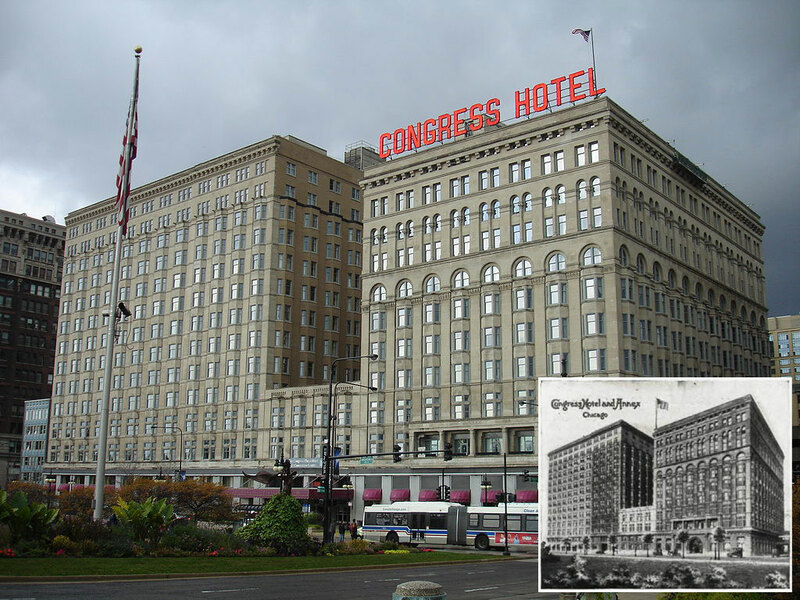 The majority of the events took place at Chicago’s Congress Hall, however manufacturers would also exhibit there wares in various locations around the city. At that time, Chicago was the centre of the US musical instrument industry, and although this event was for all musical instruments, it was the piano that dominated. Several large scale piano manufacturing plants were located in Chicago, and these would typically each produce 1,000-2,000 pianos a month. The above diary details meetings of the various trade bodies taking place during the week. Here key players discussed relevant issues and formulated ideas for the betterment of the industry. One issue apparently considered important (ref. The Music Trade Review, May 1917) and raised at The National Association of Music Roll Manufacturers’ Convention concerned the definition of the word “roll” (as in piano roll), who could use it, and what exactly it was! Other subjects discussed included: war taxes; the lack of sales promotion across the industry; and the shortage of skilled labour. On April 28 just a few days earlier, the House of Representatives amended the Army Bill to embody conscription. Munitions factories had already recruited a large proportion of the skilled workforce, but now with the commencement of conscription the industry was facing an even greater labour shortage. Perhaps this subject was a little more important than the status of the the word “roll”. The various trade bodies held their individual banquets and formal dinners, in the Congress Hotel – the main event being the National Association of Piano Merchants’ banquet in the hotel’s Gold Room. This annual event was to evolve into today’s NAMM (National Association of Music Merchants) show. NAMM continued to have its annual convention in Chicago, before introducing a winter show in California. The summer show remained in Chicago until 1990, whence it moved to Atlantic City, and then to Nashville. The winter show, held in Anaheim, CA, is now the far bigger event. In 1917 pianos dominated – today they form a very much smaller part. Chicago’s (Third) Coliseum, with the National Piano Dealers Association banner flying. The building was demolished in 1982 for health and safety reasons. 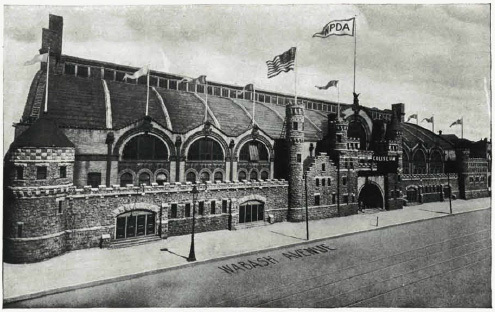 Probably the most important reason to make the trip to Chicago, was to visit The National Music Show at Chicago’s Coliseum, which enabled manufacturers to show off their new products. These included the latest instruments, newly published music rolls, and state-of-the-art talking machines (subsequently known as gramophones). I’ve included, at the end of this piece, a summary of the major exhibitors to give a flavour of the industry at that time. So 100 years ago, Chicago hosted an industry in rude health, but one obviously feeling the effects of the momentous events across the Atlantic. In the US, over 300,00 pianos were being manufactured each year. America had 50% of the world market. The piano market was at its peak. Key Exhibitors at the National Music Show 1917. AEOLIAN CO. New York. Will show the Aeolian-Vocalion. AMERICAN PHOTO PLAYER CO. San Francisco. Will exhibit Fotoplayers and pipe organs. AMERICAN PLAYER ACTION CO. New York. Will exhibit the new American Player Action. AMERICAN STEEL AND WIRE CO. Chicago. Will have an exhibit of piano wire. AMPHION PLAYER ACTION CO. Syracuse. Will exhibit the Amphion Accessible Action and Dynachord Art Expression Player. AUTO PNEUMATIC ACTION CO. New York. Will feature the Auto DeLuxe Welte-Mignon (Licensee) Player Action. BACON PIANO CO., THE. New York. Will show uprights, players and the Bacon Reproducing Piano. BALDWIN PIANO CO. Cincinnati. Will exhibit their full line. BAUER & CO., JULIUS. New York. Will exhibit Concert Grand and Bauer Art Expression player piano. BEHNING PIANO CO., New York. Will have a display of Behning pianos and player-pianos. BEHR BROS. & CO. New York. Will include Behr uprights, players and the Behr Reproducing Piano (licensee under Welte-Mignon patent). BENT CO., GEO. P. Chicago. Will exhibit Bent, Brown, Concord and Blackstone pianos and players. BJUR BROS. & CO. New York. Will exhibit the latest type of Metalnola Action. BRAMBACH PIANO CO. New York. The display will consist of Brambach Baby Grands. BRUNSWICK-BALKE-COLLENDER CO. Chicago. Will have a display of all models of the Brunswick Phonograph. BUSH & GERTS PIANO CO. Chicago. Will display several of their most popular instruments. BUSH & LANE PIANO CO. Holland, Mich. Will exhibit Bush & Lane pianos, uprights and grands, Bush & Lane Cecilian players and Bush & Lane phonographs. CABLE COMPANY, THE. Chicago. Will display Conover, Cable, Kingsbury and Wellington pianos, Solo-Carola and Euphona Inner-Players and Reproducing Home Electric Players. CABLE-NELSON PIANO CO. Chicago. Will exhibit Cable-Nelson pianos. CHASE CO., A. B. Norwalk, O. Will exhibit new style Welte pianos, players and reproducing pianos. CHICKERING & SONS. Boston, Mass. Will exhibit grands, uprights and Ampico Reproducing pianos. CHRISTMAN PIANO CO. Will exhibit the Christman line of grands, players, uprights. Also Christman Studio Grand and the famous Christman Aminon Action. CLARK PIANO CO., MELVILLE. Chicago. Will exhibit QRS music rolls and their line of pianos and Apollos. DAVENPORT-TREACY PIANO CO. New York. Will exhibit its line of pianos and player-pianos. DOLL & SONS, JACOB. New York. Will exhibit Doll & Sons, Stodart and Wellsmore pianos and players. DOMESTIC TALKING MACHINE CORP., Philadelphia. Will have a complete display of their new Domestic line of talking machines. DRACHMANN PIANO CO. Chicago. Will have a complete display of pianos, and also the Drachmann Key Control Player. EDISON, INC., THOMAS A. Orange, N. J. Will demonstrate a complete line of New Edison Diamond Disc Phonographs and Amberolas (wax cyclinder players). EMERSON PIANO CO. Boston, Mass. Will exhibit full Emerson line. EMPIRE TALKING MACHINE CO. Chicago. Will display their complete line. FISCHER, J. & C. New York. Will exhibit pianos, players and Welte. FOSTER-ARMSTRONG CO. Rochester, N. Y. Will exhibit Haines Bros., Marshall & Wendell, Franklin and Ampico Reproducing pianos. FRENCH & SONS PIANO CO., JESSE. New Castle, Ind. Will exhibit Jesse French & Sons and Lagonda pianos, players and grands. GRAM PIANO CO., EDMUND. Milwaukee. Will exhibit grands, uprights and players. HALLET & DAVIS PIANO CO. Boston, Mass. Will exhibit their line of pianos. HARDMAN, PECK & CO. New York. Will have a complete display of Hardman and other makes of pianos and Autotones. HAZELTON BROS. New York. Will exhibit their pianos and players, as well as the Hazelton Reproducing piano. A number of handsome new case designs will be shown, each in a period model and designed by a prominent New York architect and specialist in furniture and interior decorations. HEINEMAN PHONOGRAPH SUPPLY CO. New York and Chicago. Will have a display of their entire line of talking machine motors. HOWARD CO., R. S. New York. Will exhibit their full line. KIMBALL CO., W. W. Chicago. Will exhibit their line. KOHLER & CAMPBELL, INC. New York. Will have an unusually complete and comprehensive exhibit. The Kohler & Campbell uprights, players and the new Reproducing Piano will be displayed. KRAKAUER BROS. New York. Will exhibit the Krakauer line. KRANICH & BACH. New York. Will exhibit pianos and player-pianos, including new Grandette. LINDEMAN & SONS PIANO CO. New York. Will exhibit uprights, grands and players. LUDWIG & CO. New York. Will show a complete line of Ludwig pianos and player-pianos. MAGNOLA TALKING MACHINE CO. Chicago. Will display the Magnola line of talking machines. MANDEL PHONOGRAPH CO. Chicago. Will have its full line of phonographs on display. MATHUSHEK PIANO MFG. CO., THE. New York. Complete line of Mathushek pianos and player pianos will be on exhibition. MEHLIN & SONS, PAUL G. New York. Will exhibit grand, inverted grand and players. MILLER & SONS PIANO CO., HENRY F. Boston, Mass. Will exhibit Henry F. Miller regular styles. MILTON PIANO CO. New York. Will display the latest style Milton uprights and players. MUSIC TRADE REVIEW, THK. New York. NATIONAL BUREAU FOR THE ADVANCEMENT OF MUSIC will explain to the visiting dealers the plans and accomplishments of the Bureau. NATIONAL PIANO MFG. CO. Boston, Mass. Will exhibit the Briggs, Merrill and Norris & Hyde electric and foot pump players. OPERATORS PIANO CO. Will exhibit Coinola and Reproduco Player Pipe Organ and new styles of coin operated instruments. PATHE FRERES PHONOGRAPH CO. New York. Will have its complete line of Pathephones and Pathé records on display. POOLE PIANO CO. Boston, Mass. Will exhibit grands, uprights, players and electric reproducing players. PRATT, READ PLAYER ACTION CO., THE. Deep River, Conn. Will exhibit six or eight models of latest Pratt Read and Wasle Unique Player Actions, showing various devices with which players are equipped. RADLE, F. New York. Will exhibit their line of players and pianos. SCHAFF BROS. CO. Huntington, Ind. Will exhibit Schaff Bros., pianos and players. SCHOMACKER PIANO CO. Philadelphia, Pa. Will exhibit their line. M. SCHULZ CO. Chicago. Will display the M. Schulz Co. pianos and player-pianos. SCHUMANN PIANO CO., Rockford, Ill. Will have full display of all models of Schumann pianos. SMITH, BARNES & STROHBER CO. Chicago. Will exhibit Smith & Barnes, Strohber, Hoffman and Lessing pianos and player-pianos. SOHMER & CO. New York. Will exhibit complete line of Sohmer Grands, uprights and players. STAIB-ABENDSCHEIN CO. New York. Will exhibit Mastertouch piano actions. STANDARD MUSIC ROLL CO. Orange, N.J. Will exhibit Arto and Sing-A-Word rolls. STANDARD PNEUMATIC ACTION CO. New York. Will feature the Standard Player Action, of which there are over 120,000 in use at present. STRAUBE PIANO CO. Hammond, Ind. Will exhibit their full line. STRAUCH BROS. New York. Will exhibit old and new models of actions and hammers dating back into the middle of the sixteenth century. TONE & BRO., INC., WILLIAM. New York. Will exhibit various styles of pianos and player-pianos, including Triplex-Electric player, and McCammon player, Style 85. UDELL WORKS. Indianapolis, Ind. Will exhibit Udell music roll and talking machine record cabinets. UNIVERSAL MUSIC CO. New York. Will have a display of Universal Music Rolls and Uni-Record Rolls. VOCALSTYLE MUSIC CO. Cincinnati, O. The Vocalstyle rolls will be displayed and demonstrated. VOSE & SONS PIANO CO. Boston, Mass. Will exhibit the special patented features of the Vose players and unique case designs. WERNER PIANO CO. Chicago. Will have a display of their complete line. WILCOX & WHITE CO. Meriden, Conn. Will exhibit Angelus player-pianos, White player-pianos, Artrio Reproducing pianos, Artrio pianos and Cabinet Artrio Angelus. WURLITZER CO., RUDOLPH, THE. Cincinnati. Will exhibit their complete line. I have attended the NAMM Show in Anaheim many years ago. So true that there were few pianos to see (one being Elton John’s piano) but many keyboards on display now, along with software presentations, music book publishers, etc. Thanks for the great post and wonderful photos!